“What more is there to say?” It’s a question that plagues any attempt to wade back into yesterday’s headlines—the stories that have been covered so exhaustively, so round-the-clock extensively, that their every sordid detail is now burned into the public imagination. Indeed, without new information, what more can be said, for example, about the still-unsolved murder of child pageant queen JonBenet Ramsey? And what fresh insight can be gleaned from the caught-on-tape beating of Rodney King and the unrest that rocked Los Angeles after the police officers responsible were acquitted? These are the separate subjects of two movies arriving on Netflix this week, entirely different and yet strangely similar in their unconventional approaches to media milestones of the ’90s. Neither film features a single date-stamp, a single news clip, even a single image of Ramsey or King. Instead, both filter these highly public tragedies through the scrim of performance, allowing actors to talk through the pertinent facts and details, mixing simulated emotions with their real ones. Kitty Green, the director of Casting JonBenet, spent 15 months in Boulder, Colorado, where Ramsey’s 6-year-old body was found, on December 26 of 1996, in the basement of her family home, tucked underneath a blanket. Most of the film is presented as audition footage, with people from the area—many with little to no screen experience—trying out for the role of Ramsey herself, as well as the roles of her parents, John and Patsy, and her older brother, Burke. Green cuts judiciously throughout to scene-setting reenactments starring these amateur actors, shot with a cool-blue gleam somewhere between Fincher and Lynch on the murder-mysteries-by-David spectrum. It’s clear, however, that the real purpose of the project isn’t this incomplete film-within-the-film but the interviews with its prospective stars, assembled into a court of public opinion to discuss their own recollections, hypotheses, and personal feelings about the Ramsey case. It all comes up, in a crosscutting dialogue of wild speculation: the doubts raised by the ransom letter; the suspicions provoked by the parents themselves, so peculiar in public appearance; the various suspects that drifted into the investigation’s orbit. Was it stage mother Patsy who killed JonBenet, out of some warped jealousy? Was it an accident perpetrated by the girl’s 9-year-old brother, compelling John and Patsy to stage the kidnapping to protect their surviving child? (In one disquieting passage, the kids auditioning to play Burke do their best to smash a watermelon with a hammer, proving or disproving whether a boy his age could have caused the cranial trauma young JonBenet suffered the day she died.) There’s something a little have-your-cake-and-eat-it-too about Casting JonBenet, which gets to address every salacious theory (Pedophilia rings! Pervert mall Santas!) without necessarily entertaining any of them. After all, it’s the interviewees who bring this stuff up, with about the same conspiratorial zeal as the diehard Kubrick nuts of Room 237. But Green is after something a little more. Her interest seems equally devoted to the actors themselves, an interesting cross-section of Boulder residents whose own personal issues (a death in the family, a cancer diagnosis, a traumatic experience from childhood, etc.) begin to bleed into the conversation. Casting JonBenet is deliberately edited to imply a kind of deepening perspective, as the talk turns from raw gossip—the kind that was impossible to escape back when JonBenet’s makeup-slathered face was sensationally filling television screens everywhere—to something resembling empathy, provoked perhaps by the act of playing the very people they’re coldly psychoanalyzing. The film ends on a strangely moving theatrical exercise, as the various performers gather together on a soundstage recreation of the Ramsey home to dramatize all the major theories in tandem, creating an overlapping spectacle of speculative horror. Green’s point comes through clear: We’ll probably never know who killed JonBenet Ramsey, but whatever happened in that house, it deserves more sensitivity—more nuanced understanding—than the nightly news cycle allows. If Casting JonBenet is able to momentarily step outside of the media frenzy that swirled around this story, it’s because the film refracts it through the experiences of its talking heads: What we’re watching is a group of ordinary Americans work out, and maybe move past, the dominant public narrative of Ramsey’s murder. Spike Lee’s new joint does something similar, collapsing an entire passage of recent American history into a single monologue. 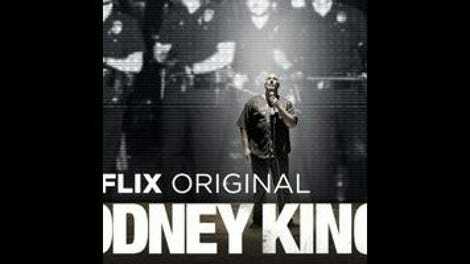 Filmed live at East River Park in New York City, Rodney King finds actor, playwright, and Lee regular Roger Guenveur Smith performing a blistering one-man show about “the first reality-TV star,” taking us through the late cab driver’s fateful, videotaped encounter with the LAPD to the subsequent riots to King publicly asking, to much ridicule, “Can we all get along?” Throughout this nearly hour-long slam-poem address, Smith time-travels across the 20th century, connecting King to Malcolm X and Bill Cosby and the Zoot Suit Riots. What he’s attempting, with irony and ambivalence and a sometimes religious fervor, is to address King the man, square him against King the icon, and place him on the continuum of America’s enduring racism. This is the second time Lee has filmed one of Smith’s plays, and like A Huey P. Newton Story, about the Black Panthers founder, it’s more of a valuable document of an event than a full-fledged movie. Lee flexes his stylistic muscles here and there, cutting with the flashing of police lights or the boom of sound effects that Smith works into his stage presentation. Mostly, though, Spike smartly cedes the spotlight, never attempting to upstage the performance he’s capturing. Drenched in sweat, looming large but speaking with an impassioned hush, Smith delivers his achronological history lesson like a man possessed, channeling the rage of a nation into a breathless, rat-a-tat flurry—all asides and repetitions and vivid details, like the gulps of liquor King takes as he watches a whole city explode in his honor. In the end, both Rodney King and Casting JonBenet view their subjects as prisms: Through their widely publicized tragedies, we can see the world, and maybe ourselves. That may not be a new concept, but it’s justification plenty to take one more look at these true crimes.